As a child I hated beans. But somewhere along the line I had a cracking good bean soup that changed my mind. Once I had to tighten the belt I decided to try to recreate it myself. So, for all of you budget bargainers out there (I know I am not the only one!) here it is, my Recession Bean Soup recipe. 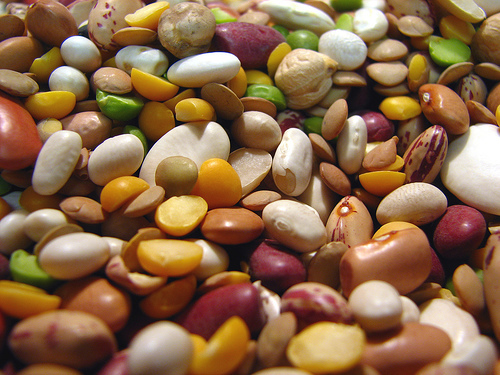 First off, we all know legumes (somehow it sounds more classy to say legumes instead of beans… be sure to snootily – or sexily – elongate the ‘oo’ when you say it) are crazy good for you. Protein, fiber, and magic. But, there’s a certain squeamish factor about, um, their effect on your digestive system. But don’t worry. If you use dried beans, simply rinse and rinse and rinse until the water no longer foams, and you will not offend anyone in your presence after consuming. There are a couple of essentials. You need a stock pot, obviously. Saute a trifecta of your choice in a little olive oil – I use chopped celery, carrots, and garlic, but if you’re not a fan of celery you could easily substitute bok choy, napa cabbage, or even leeks instead. Don’t like carrots or garlic? You’re on your own. Saute until the carrots are softish (yes, this is how I do recipes) then add about five cups of vegetable broth. While you’re bringing it to a boil, rinse off your beans as mentioned before. Oh, right! What kind of beans? Well, just grab one of those el cheapo pre-mixed dry packs for less than $5. Your choice. Pop ‘em in the pot after rinsing rinsing rinsing, reduce heat to simmer, and step back for HOURS. Go for a bike ride, read, pet the dog, whatever. This is a slooooooow food process. Let those beans melt, fall apart, do not do not attempt to finish before the beans have released themselves into the broth with a sigh. This takes about four hours. Sorry. If you use canned beans it will take no time at all, but, you miss the magic fun. Ah, something like that. To finish, you can do a couple of things. I like to up the protein quotient and add chopped up chicken sausage, while upping the fiber content by adding sauteed mushrooms. Zucchini is a nice touch and brings you a bit closer to a minestrone. I don’t add pasta but hey, knock yourself out. Remember, you’re trying to fill yourself up here so you don’t crave your usual sushi lunch! As long as you aren’t buying a ton of ingredients and throwing in the kitchen sink, it’s fine. Now add herbage. Your choice again. I like to sip off some thyme and oregano from my little flower pots and toss those in at the last second. Dried herbs are of course fine, curry actually would rock, and always always add salt and pepper to taste. Divide amongst whatever storage you’ve got and you should have about five meals, for lunch or dinner, at a fraction of the cost you would spend eating out. Your budgeting conscience is clear, your tummy’s full, you can pretend you’re Tuscan! Rationalization mission – accomplished.